from Russia who made their way to Canada under impossible circumstances! The exhibit is at the Ambrose University in Calgary and will be there for another few weeks. There was a reception at the opening of the exhibit in early March and the artist Ray Dirks was present to give background to his reasons for creating the paintings. This reception also included a choir and a story from Hugo Neufeld who had a direct connection to one of the paintings. Two weeks later a group of 21 women came from various Mennonite churches in the Calgary area to view the exhibit. The event was billed as Gramma Stories. There were presentations from four women. 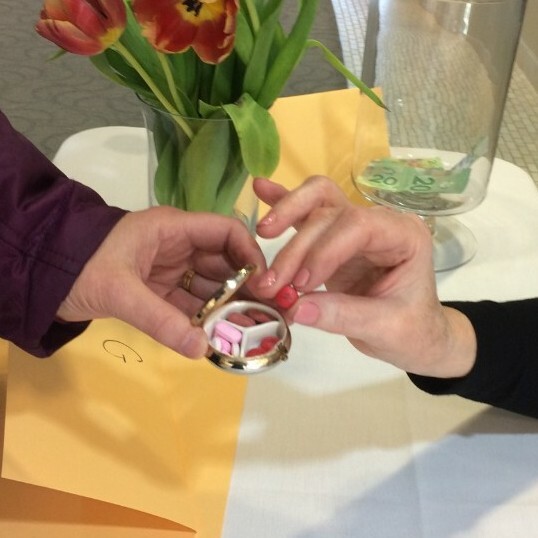 Jeanette Thiessen told the story of Grandma Baerg who endured many hardships. When they arrived in Quebec after an uncomfortable trip they were surprised by offerings of sandwiches, cake, and the Gospel of John! R ose Klassen passed on the story of her Grandma Retzlaff who lost many members of her immediate family including two infant daughters, during her escape from the Red Army. 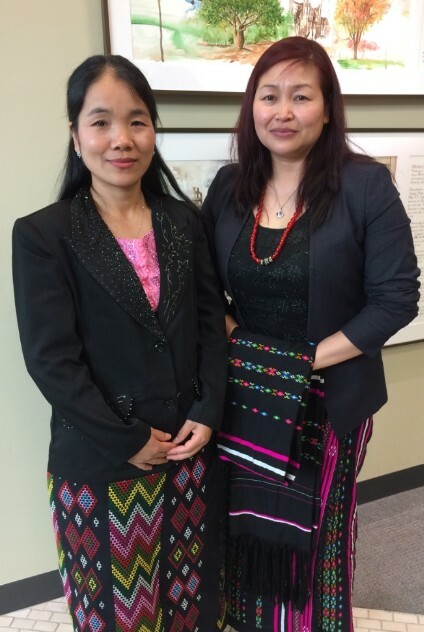 Two Chin ladies Tial Mawi and Hnin Tida, dressed in their cultural outfits told us their modern day trek from the Burma jungles to Calgary. They repeatedly said how their faith and determination got them to the beautiful Canadian country. The Chin congregation joined MCA in 2013. There were other spontaneous stories that included a beautiful pill box and a hand sized manicure set that served the entire group in Siberia.